The Animation program supports traditional hand-drawn, 3D computer, stop motion and any animation techniques that can be imagined or explored. Looking around, animation is seen everywhere: theaters, television, smartphones, advertisements, and all over the web. Students will explore the variety of techniques available to the current animator, hone traditional skills, learn how to tell engaging stories, create memorable characters, and bring their concepts to life. Animation alumni work on blockbuster special effects films, animated television series, commercials, and video games in a variety of roles–from director to animator to storyboard artist to editor to many other positions. As an undergraduate, students are able to create a sophomore piece, a junior animated film and a senior animated thesis–three distinct opportunities to work through the complete process from concept to design to storyboard to rough animation to a final animated film with a full soundtrack. 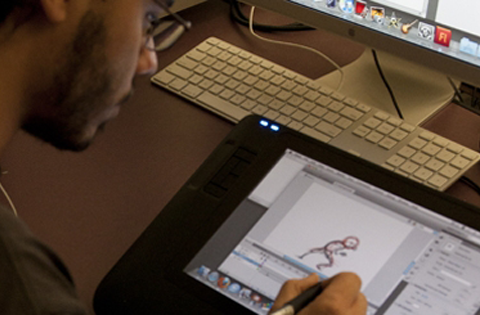 The skills learned as an Animation major allow students to adapt to evolving industry technical needs while working to create their own quality content as ideas become even more valuable than the techniques needed to realize them.